Top left and right: juvenile Puget Sound king crab. Note the fairly uniform orange colour and the exaggerated sculpting on the carapace, both of which indicate a juvenile. Bottom left: adult. Photos by Jenn Burt. 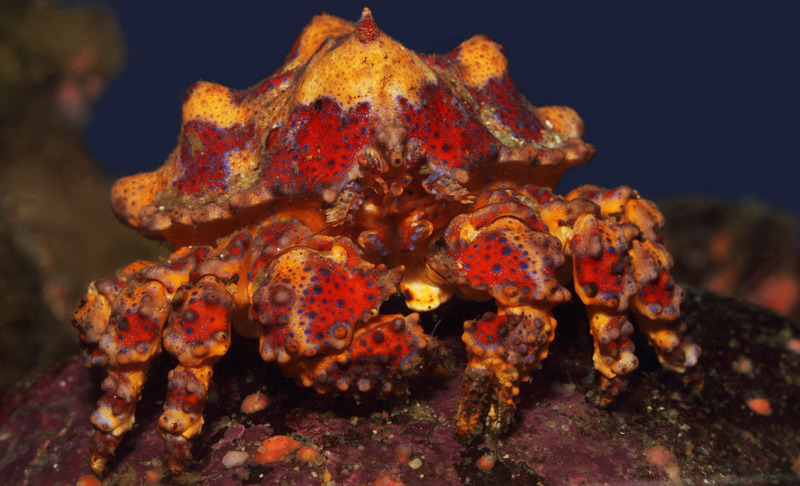 The Puget Sound king crab is not difficult to recognize, with its ornate carapace structure and bright colouring. Its red body bears patches of bright yellow, orange, blue, and purple — as do its legs and claws — and it has a solid, boxy shape. Its carapace and appendages are studded with small bumps and taller cone-shaped projections. Juveniles start off even bumpier and bright reddish-orange. This large and solid crab, described by Lamb and Hanby as an "underwater mini army tank," can have a carapace measuring more than 30 cm across. See the E-Fauna species page for more photos. The Puget Sound king crab, named for the inlet in northwestern Washington State, is found from Sitka, Alaska to Monterey, California. 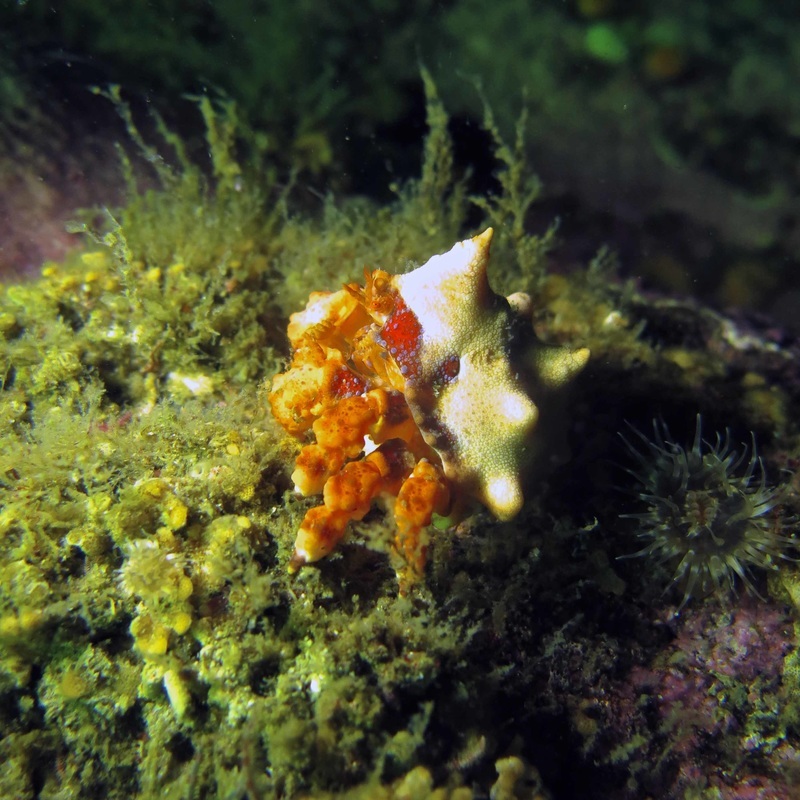 It inhabits rocky subtidal locations with strong currents, to 137 m deep. Beachcombers may occasionally find juveniles under rocks during unusually low tides. Adults are found in shallower waters while breeding in late winter and spring. 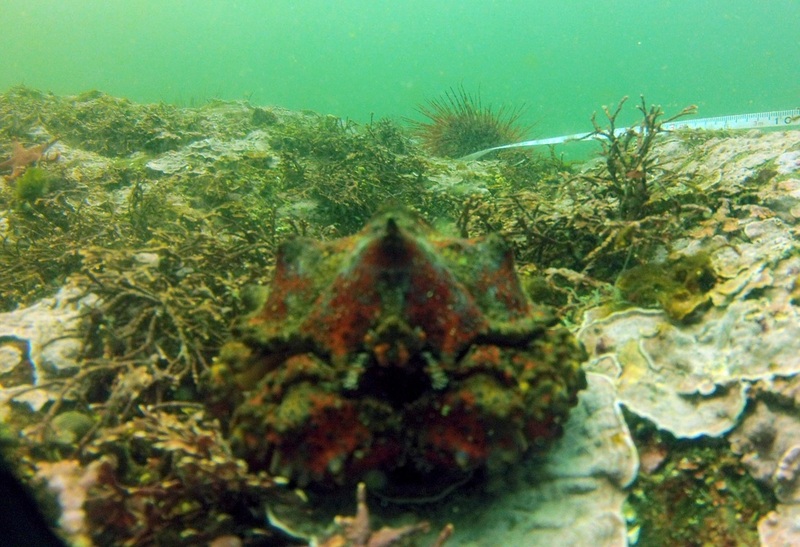 The brown box crab (Lopholithodes foraminatus) has a similar shape but is dull reddish-brown or tan in colour. 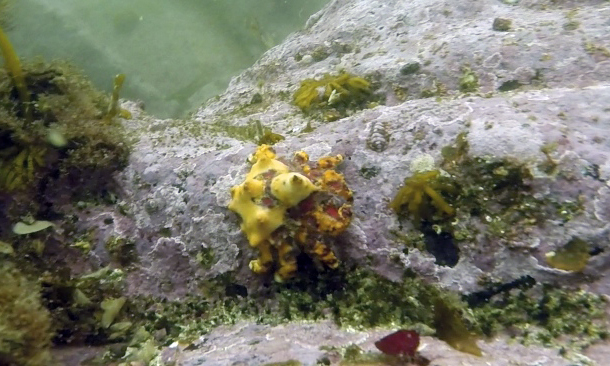 The Puget Sound king crab eats sea urchins, other echinoderms, and sea anemones. Hart, J. Lopholithodes mandtii Brandt, 1849. In Klinkenberg, Brian. (Ed.) E-Fauna BC: Electronic Atlas of the Fauna of British Columbia. Lab for Advanced Spatial Analysis, Department of Geography, University of British Columbia, Vancouver. Accessed 28/09/2015. Jensen, G.C. (1995). Pacific Coast Crabs and Shrimp. Monterey, CA: Sea Challengers. P. 72-73.